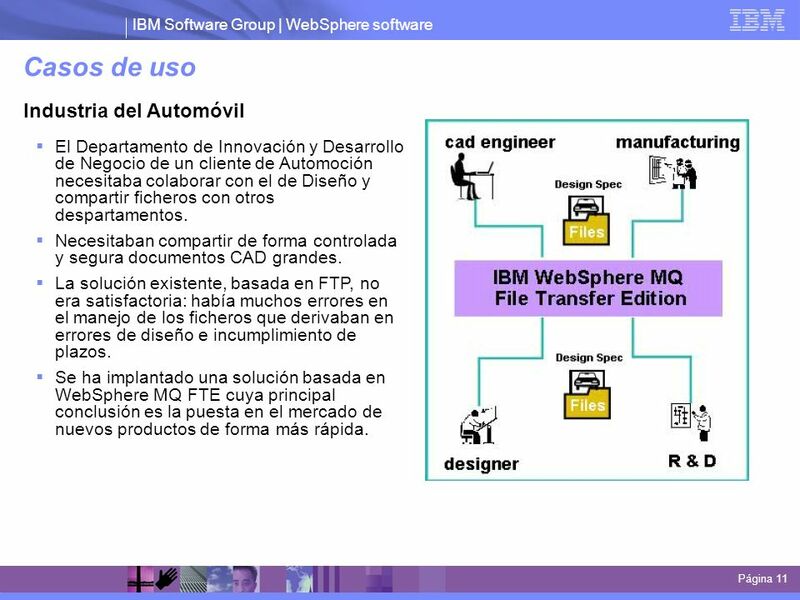 IBM WebSphere MQ File Transfer Edition para la Transferencia de Ficheros Gestionada Septiembre de 2010 Standard template for internal and external presentations. 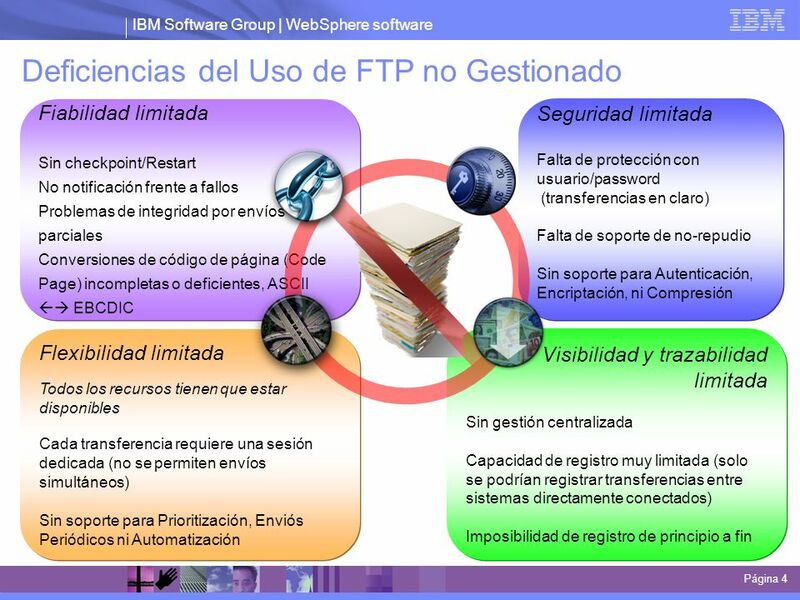 5 ¿Por qué una Solución de Transferencia de Ficheros Gestionada? 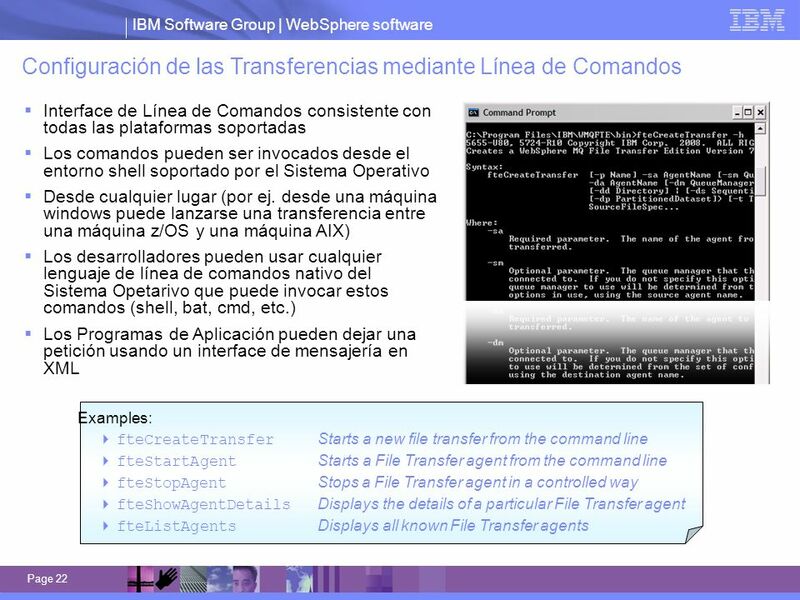 Progreso de las transferencias en curso This screen captures shows the Current Transfer Progress Log and Transfer Log in the WebSphere MQ GUI. Note the completion status records in the File Transfer Log change color depending on the completion status value. 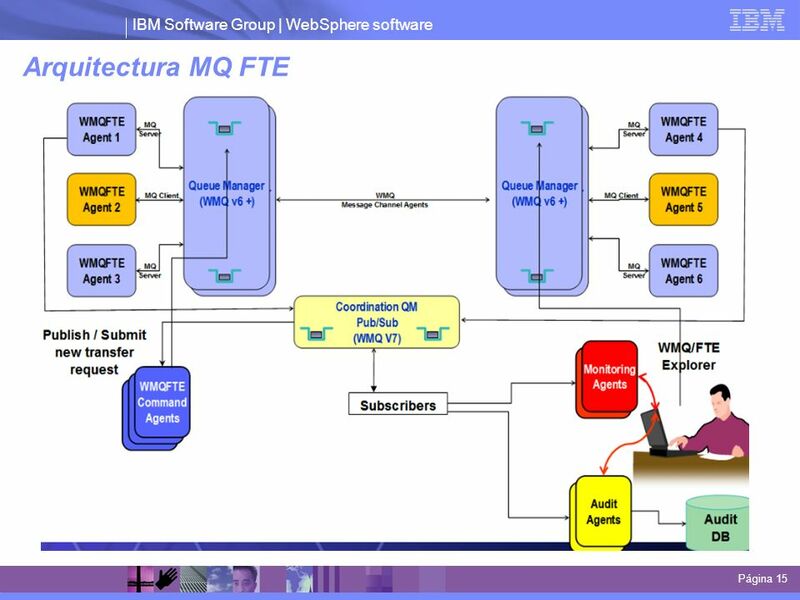 This picture is a screen capture of the WebSphere MQ File Transfer GUI. 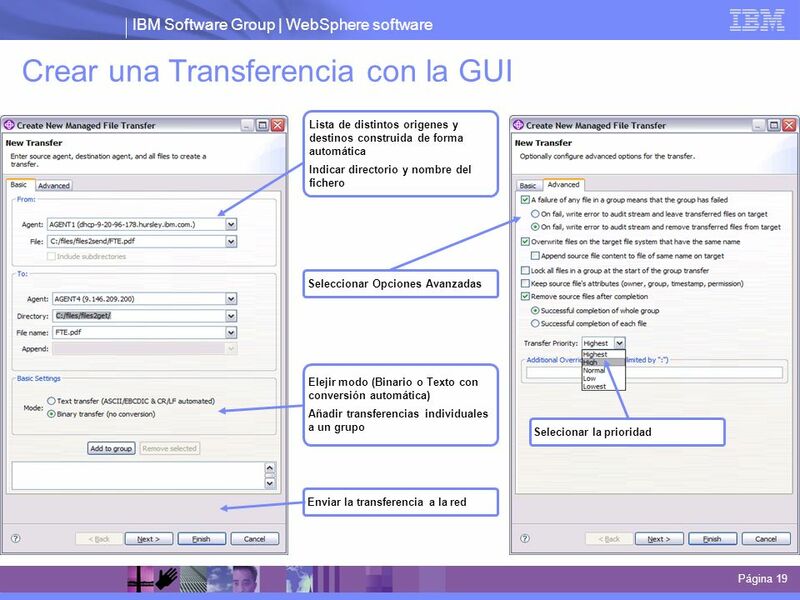 To create a new transfer request, right click the Transfer Log entry in the WebSphere MQ Explorer navigator and click “New Transfer”. This will open up a dialog window where you specify the required and optional items. 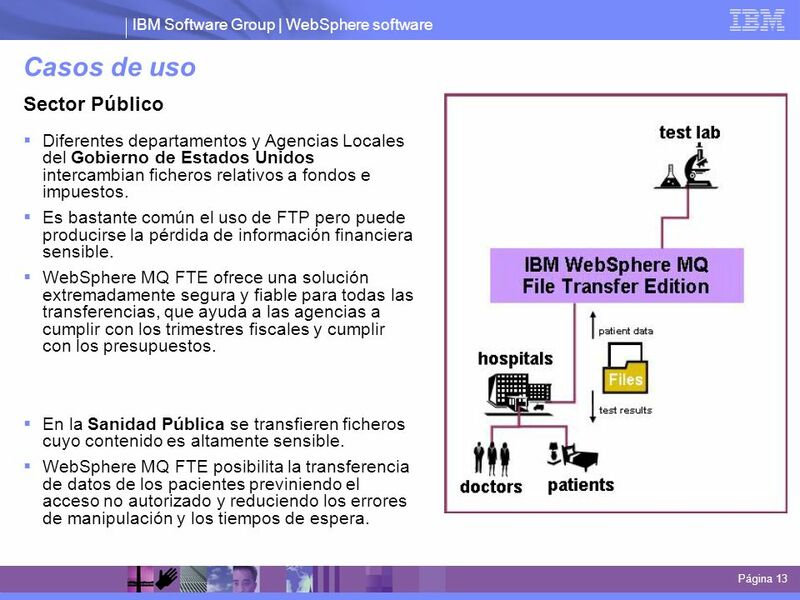 Fecha de inicio 2) Intervalo de repetición 3) Fin de la repetición This screen capture shows how to enable a scheduled transfer in the WebSphere MQ File Transfer GUI. 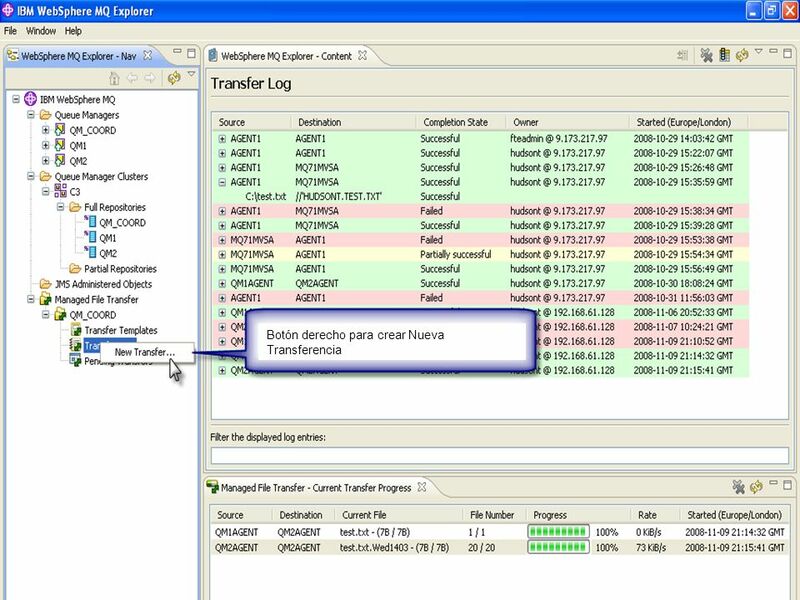 Clicking the “Enable scheduled transfer” check box displays the options on the screen. The time base specifies either which system time you want to use for the scheduled file transfer, or if you want to use coordinated universal time (UTC). 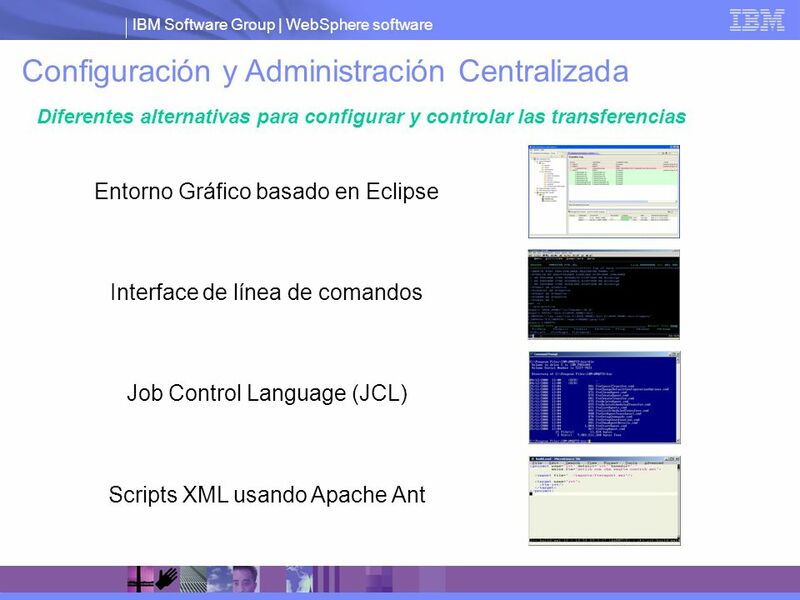 The options are: admin: the start and end times used are based on the time and date of the local administrator's machine. If you select this option, the time zone of the administrator's machine is displayed next to the Time base field. Source: the start and end times used are based on the time and date of the source agent's machine. If you select this option, the time zone of the source agent's machine is displayed next to the Time base field. UTC: the start and end times used are based on coordinated universal time (UTC). To change the start date you can either click the calendar icon and selecting a date or you can overwrite the date directly. You can also click the day, month or year and adjust these values by clicking on the arrows to adjust the individual fields. If you want to repeat the scheduled transfer click the Repeat check box. 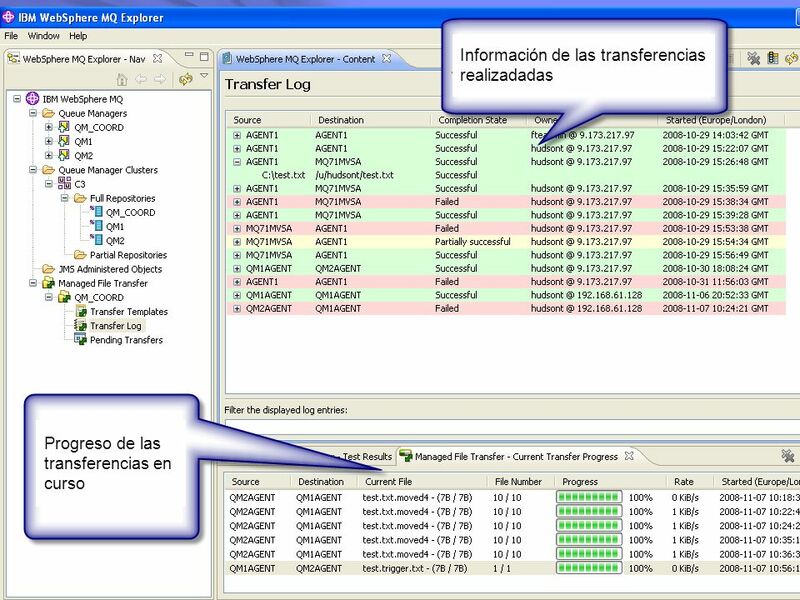 You can optionally repeat the transfer schedule until a specific date and time, for several repetitions or indefinitely. In this dialog you can also optionally specify additional trigger conditions by clicking the Triggers tab. 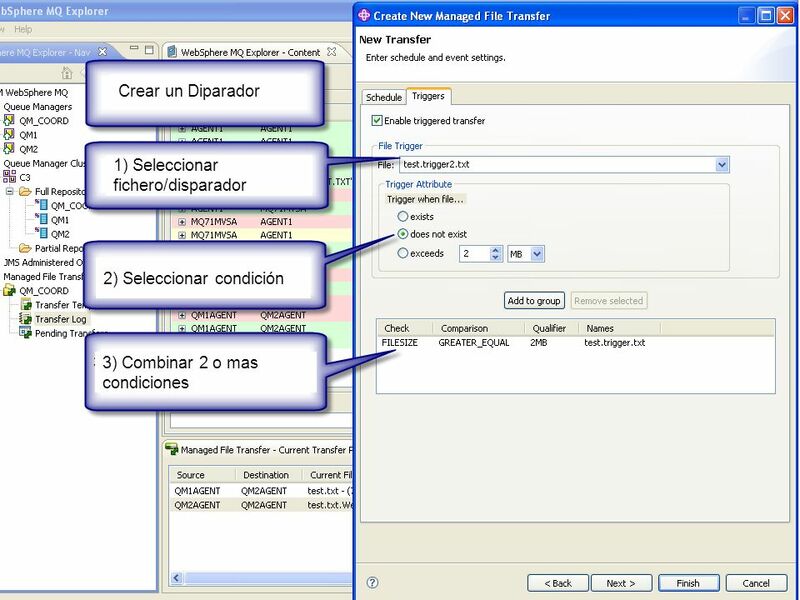 Crear un Diparador 1) Seleccionar fichero/disparador 2) Seleccionar condición 3) Combinar 2 o mas condiciones This screen capture shows how to specify a conditional trigger transfer request using the GUI. 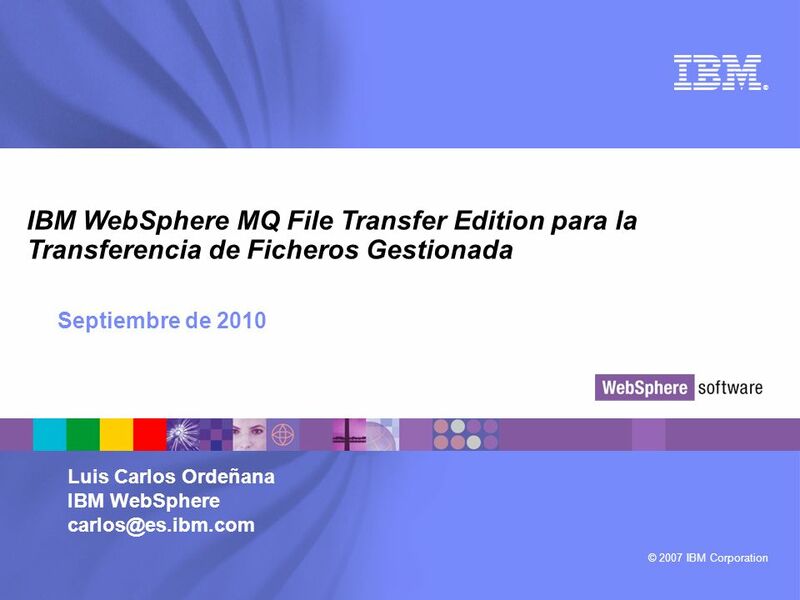 Descargar ppt "IBM WebSphere MQ File Transfer Edition para la Transferencia de Ficheros Gestionada Septiembre de 2010 Standard template for internal and external presentations." 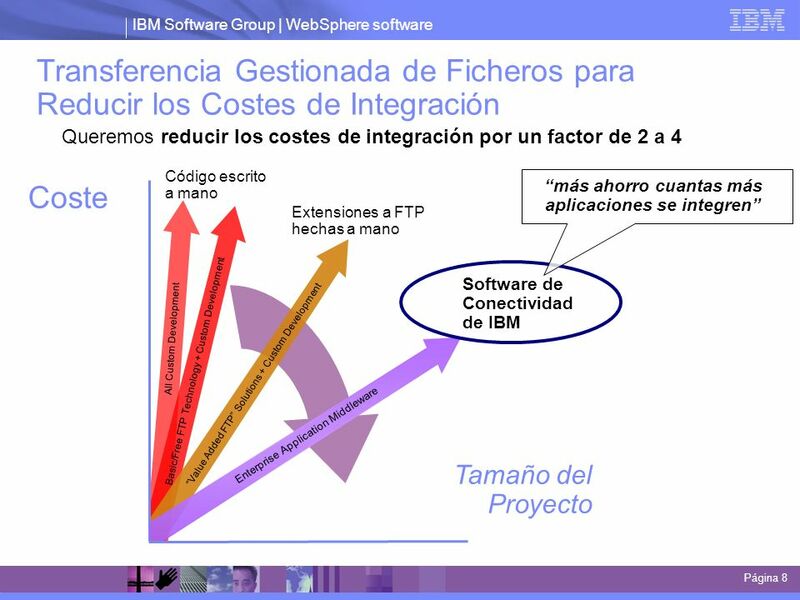 Programa para el Impulso a la Implementación del Protocolo IPv6 en Instituciones Vinculadas a RENATA 2012 Servicio FTP. 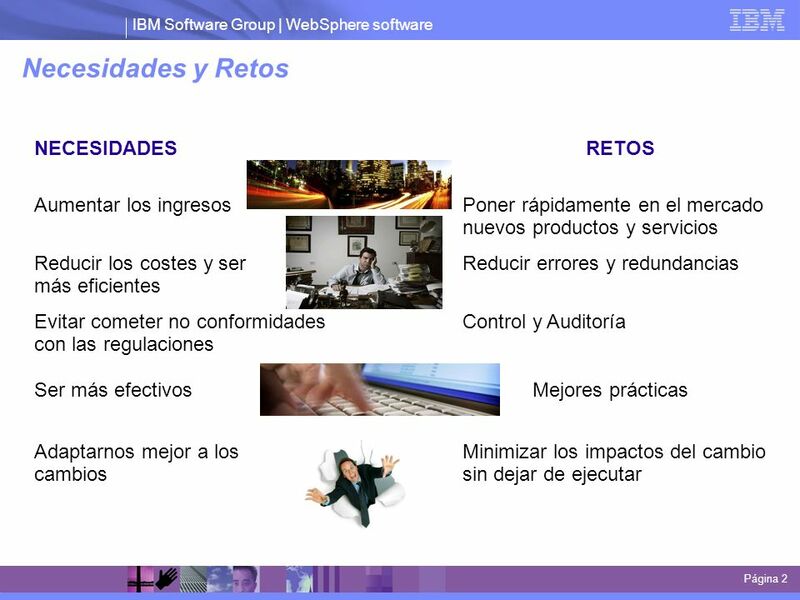 Systems Management Server 2003 Santiago Pastor Zaltor Soluciones Informáticas.